A Weekend Filled with Scifi, Fantasy, and some 80’s Nostalgia! Prepare yourself for a fantastical weekend in Birmingham! You can check out “Shrek: The Musical,” attend a massive SciFi Fest, and take a trip back to the 1980’s via the music and showmanship of The Molly Ringwalds! Check out these and many more events below! Come see the culmination of the ArtPlay summer theatre camp! This production of Shrek-The Musical Jr. will be full of laughs and fun! It’s also FREE! Bring out your kids to see everyone’s favorite Ogre in action! There are few showtimes to choose from, so this will be an easy event to fit into your schedule! Join us for the seventh installment of the Last Thursday at Revelator Coffee Company series. For the July edition, Thed Weller will be hosting the Friday Eve Poetic. They invite poets, singers, musicians, and more to join in & share their talents with an engaging audience! They will also have the bhamstands board for those who want to take pictures. There are only a couple of Thirsty Thursdays left this season! Get your friends together and enjoy drink specials during the Barons Baseball game! Head on out behind center field to enter to win a beach trip! Also, Tortugas Pizza, located behind Good People Brewing, will have drink specials before the game in case you want to grab a slice on the way in! Come to the Hoover Library Science Fiction and Fantasy Festival. If you’re into comics, gaming, fandoms, manga, anime, cosplay, etc – you will love this event! The Hephaestus will have several Star Trek panels and many opportunities to meet other clubs and Science Fiction/Fantasy Fans. Food trucks and vendors will be on site as well as a free shuttle. Thurs 7pm (trivia). Fri 7pm-11pm. Sat 10am-10pm. Sun 1pm-6pm. Come and enjoy the dynamic energy and breathtaking view! Sunset Market at Founders Station is a scaled down evening market showcasing one of downtown's newest developments. A handful of local producers were selected to entice and inspire the community. There will be cold brew teas, artisan baked goods, freshly made bagels, raw local honey, ceramics by Nabeel Emaish, fiber/book/paper art by Doug Baulos, collage work by Joni Moore, and paintings by Vincent Rizzo. Art On The Rocks brings three Friday nights of entertainment to downtown Birmingham with artist collaborations, interactive performances, food, cocktails, and more! July’s event will feature musical guests Seratones, whose big sounds serve up a combination of Southern musicality, garage rock ferocity, and general badassery. On Friday, July 27 ART TOWN will host a multi-dimensional event celebrating the closing the Fresh Dirt Surrealist Sympatica Exhibition. Fresh Dirt is the deep South’s newest artistic collective researching practicing Surrealism in the 21st Century. Along with the visual exhibition of artworks, there will be Surrealist inspired performances by the South’s most potent improvisers. The Exhibition and performances are open to the public. There will be a $10 donation requested for the guest artists, and support of Art Town, a vital community artery of the multi-disciplinary arts in Birmingham! Don’t miss the July Loft Show! There will be are by Emilee Palmer and Michael Acuff! There will be music by JD Wilson, Zach Cannella, Matt Sanderlin! Come out and support local artists and musicians at MAKEbhm! Be sure to get some Big Spoon ice cream on your way in! Beat the July heat and come inside for FRESH GROUND COMICS. The best showcase of local stand-up comedy! ONLY $5! Enjoy some laughs, coffee, beer, wine and the best damn cupcakes in town! Unfortunately, the kitchen won't be open but there's plenty of sweets and a BEER SPECIAL of Good People's Muchacho Mexican Beer $3 & Coors Light $2! Join the merchants of Downtown Homewood for the seventh annual Sidewalk Sale! Lasting throughout the entirety of the day on Saturday July 28th, merchants will line the sidewalks in front of their shops with merchandise discounted up to 75%! Come early and shop local! Get to know the 3rd Avenue North Theatre District! We’re rolling out the red carpet for you to see what’s new on 3rd Avenue North! This is your opportunity to see downtown’s latest renovated spaces and meet the exciting new businesses on Birmingham’s most theatrical block. Visit one of the participating 3rd Avenue North locations on July 28 to get your backstage pass to our unique offerings, specials, and a chance to win prizes! Participating locations include: Forma Arts + Wellness, Wheelhouse Salon Downtown, Revelator Coffee Company, Shu Shop, Alabama Theatre and Lyric Fine Arts Theatre. It's the biggest event of a lifetime that happens once a year... Otey's Fest. 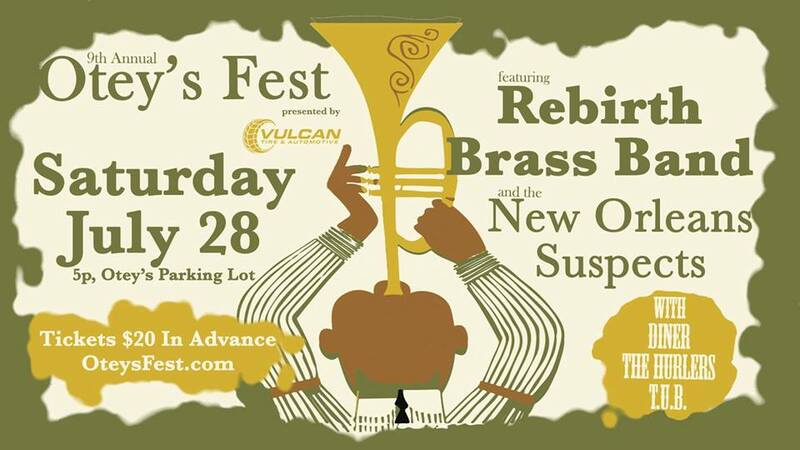 This year, they get funky with Rebirth Brass Band, the New Orleans Suspects, Diner, The Hurlers, and T.U.B. - all jammed in for a big day and night party! Rodney will be out on the big grill cooking cheeseburgers, chicken sandwiches, and hot dogs. They'll have a bounce house kid's zone - and kids under 12 get in free! Gates open at 5pm, and it's a party straight on until morning! The Molly Ringwalds return to Iron City! Come be a part of an incredible 80’s music experience! The band will rock out in full 80s costumes! Come hear your favorite 80’s hits and sing along with a packed house! People always come dressed in their 80’s best! See you there! Prepare for a double dose of HACK N' SLASH fright flicks on deck. And, yes, there will be blood. INTRUDER is gore filled supermarket slasher from the maniacs behind the classic EVIL DEAD. The second feature hails from south of the border, GRAVE ROBBERS is an insane mix of black magic, cheesy dialogue, and gooey effects. Don't be left saying, "I'll be right back!" This event is BYOB. Feel free to bring your own wine or beer. They will have a concession stand with beverages as well as popcorn and pizza for sale by the slice! 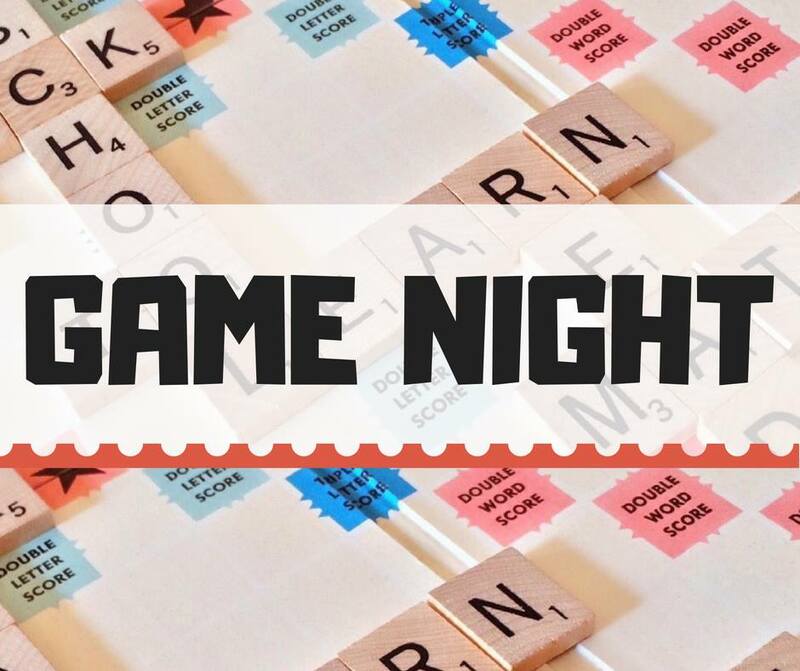 Doors open at 8pm with a pre-show and trivia with prizes for the winner! Magic City Smooth Jazz in the Park. This week features Bo Berry and Kenya at the Historic Sloss Furnaces! Bring a blanket or a lawn chair and relax at the end of a busy weekend. This will be a great event for the whole family!